Some modern fanned flue systems allow for the location of room-sealed boilers on internal walls rather than on exterior walls, and with flue systems that can be up to 30m in length. Whilst this is not the preferred approach (ideally the flue length should be kept to a minimum and this is best achieved by locating the boiler on an external wall), it does give architects and building designers more flexibility. This can be particularly useful in multi-storey flats and apartments where space is limited. In these circumstances, the boiler flue is often concealed within a void space such as within the ceiling or in specifically provided ducting. Problems can arise when it comes to carrying out a safety check when the boiler is commissioned, at an annual safety check, or following any maintenance activity on the system. The operation of the appliance to ensure its safe functioning. In order to carry out these checks, the gas engineer needs to carry out a visual inspection across the full length of the flue system. British Standard 5440-1 applies here and further advice is available within the regulations or from the technical bulletins issued by Gas Safe. The problem occurs where the engineer cannot gain access to the flue to carry out a full visual check along the length of the flue because it is not possible to gain access to the ducting or to the ceiling void. This has now been recognised by the gas industry and in 2008 the HSE issued a safety alert covering this situation. The dangers arising out of a malfunctioning or leaking flue system are that the boiler may not operate correctly and that carbon monoxide is discharged into a living space with a potential fatal incident occurring involving the occupants. Arguably, this risk may be even greater where the flue is ducted through a flat or apartment so that there is a strong likelihood that fumes will enter the flat itself or even into neighbouring living accommodation. A safety check must be carried out on a gas boiler installation, including the flue, prior to it being commissioned. In new buildings, gas boilers are normally installed in two stages. The flue is built into the fabric of the building as a first fix. The boiler itself is then installed and commissioned by a qualified gas engineer as a second fix. As part of this routine the gas engineer must check that the flue has been correctly installed and is operating efficiently. The gas engineer needs to check that the flue has been installed in accordance with the manufacturer’s instructions including the maximum length of the flue, the materials used, flue joints, flue supports and appropriate gradients. If the commissioning engineer is unable to determine this, perhaps because no access has been provided to allow for a visual inspection, he or she should not connect the appliance. He should cap off or plug the gas supply to the boiler and attach an appropriate notice to the boiler warning that it should not be used until a qualified gas engineer has carried out a safety check. These problems can, of course, be avoided at the building design stage. When new buildings are designed, or where older buildings are refurbished, proper provision needs to be made for the annual safety inspection and maintenance of flues. For preference, boilers should be located on external walls with a minimum flue length. However, where a boiler is located on an internal wall and where the flue is concealed within a void space or inside a ducting, adequate means of access must be provided from the outset. As a minimum, inspection hatches should be fitted at intervals that allow a visual inspection of the whole installation. This should be large enough to enable a visual inspection but not necessarily physical access and should be made of material that provides fire resistance and cuts down noise from the flue or boiler. Where no provision for access to a flue has been provided and a visual check cannot therefore be made as part of an annual safety check, the landlord needs to consider what actions may be taken to ensure compliance with the regulations and to safeguard the health and safety of tenants. In these circumstances, landlords should always seek the advice of a qualified gas inspector. Ideally, the installation should be replaced by one where the boiler is fitted to an external wall. Alternatively, inspection panels, as described above, should be retro-fitted to allow visual access to the flue as described above. the existence of similar gas installations within the block or development. In addition to the above, a flue gas analyser (FGA) can be used to check the products of combustion. Where these exceed the manufacturer’s recommended limits, or exceed those stated in BS 7967-3, the installation should be considered “at risk” and should be made safe. Based on this assessment, your gas engineer will tell you whether he or she considers your installation to be not to the current standard, at risk or immediately dangerous. The risk assessment should be carried out by a qualified gas engineer. If the engineer finds problems with any aspect of the installation this needs to be reflected in the risk assessment. Equally, if the engineer is unable to determine whether there is a problem, for example because he cannot access the flue, it must be considered that a problem might exist and this too must be reflected in the risk assessment. Based on the findings of the risk assessment, the gas engineer will make recommendations as to what remedial actions are appropriate. Property owners, landlords and tenants living in, or responsible for, properties with gas central heating appliances (boilers) that are located on internal walls. These types of boilers may have a flue that runs through the ceiling void (the space between the ceiling and floor of the room above); within a purpose built enclosure/duct or even through another property. Builders, property developers, managing agents and gas engineers. If your boiler is located on or near an external wall (where the flue goes straight out through the wall or goes vertically out through the roof), you do not need to read any further. Cost to install inspection hatches. Does not compromise the building structure in any way. For the above reasons it may be necessary to contact the lease holder for permission to carry out any works and local building control to ensure that the works do not compromise any of the building structure. The guidelines issued by gas safe recommend that inspection hatches be a minimum of 300mm x 300mm and wherever possible installed within 1.5 metres of any joints / bends, however this may not be practical in many properties and the attending engineer will advise of the best possible solutions that meets the guidelines. From previous installations we estimate that the majority of properties will require one to three inspection hatches to meet the guidelines. Costs detailed below are only an estimated labour cost based on the general layout of properties that we have visited. 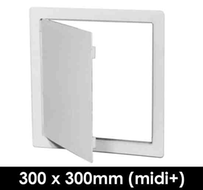 As a general rule we estimate that the majority of dwellings will require one to three inspection hatches to comply with TB2008 regulations. Our costs include cutting of existing plasterboard ceiling or plasterboard wall, fitting of access panels to ceiling/wall where required and making good to ceiling/wall around the inspection hatches, if required.